Okanagan, willing to travel anywhere. I work on a reward basis and 15% of all money made goes to charity... Penticton Children's Hospital.I have a call out fee of $25 if the ring is not found, this covers my fuel expenses. Beaches, Parks, Lakes & Yards... I also have an underwater metal detector and can search up to 5 feet of water. I run a metal detector sales and rental company out of my home. 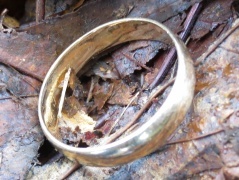 I have over 40 years of metal detecting experience, and I've been helping people find their lost jewelry for 11 years. I'm a man with metal detectors and a desire to help people find what they have lost. I enjoy this service and helping people! That's why I joined The Ring Finders. Very tired at the end of a day of filling bags of leaves, I was very much disturbed to discover my ring finger bare of my wedding ring and was downhearted as I contemplated the daunting search of our yard. Our son rented a metal detector but we found what we really needed was an experienced operator. Ken was more than that. He was eager, dedicated, and determined to find my missing wedding ring. Perhaps he was a bit sentimental, too, as he and his wife were also married in 1964. After first searching our front and back yards without success, Ken promised to return to empty and search each of the twenty bags. As good as his word, Ken returned, persistently emptying each bag until he picked up a signal in the lucky thirteenth bag! Thank you, Ken! Canada Day weekend our family was swimming in Okanagan Lake. 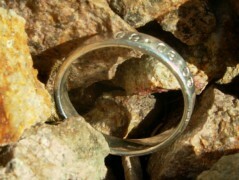 I reached out to my son and was filled with terror as I realized my wedding ring was gone! A panicked search by my husband, son and several helpful beachgoers proved unsuccessful. That was when a gentleman at the beach told me about Ken. He responded to my email almost immediately and was in the water at 5am the next morning. He didn't find it that day, but Ken was undeterred. "Oh I'll find it," he said. Sure enough, Tuesday morning, deep in the waters of Okanagan Lake he got a hit and knew it was my ring. He was right! 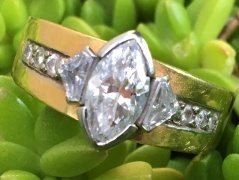 Besides the financial value, my wedding ring was created with stones from my mother and grandmothers jewellery and is very dear to me. I had lost all hope of ever finding it. Thanks again so very much for your quick response time and determination to find my sons ring. You are truly amazing and we ALL thank you so ever much.